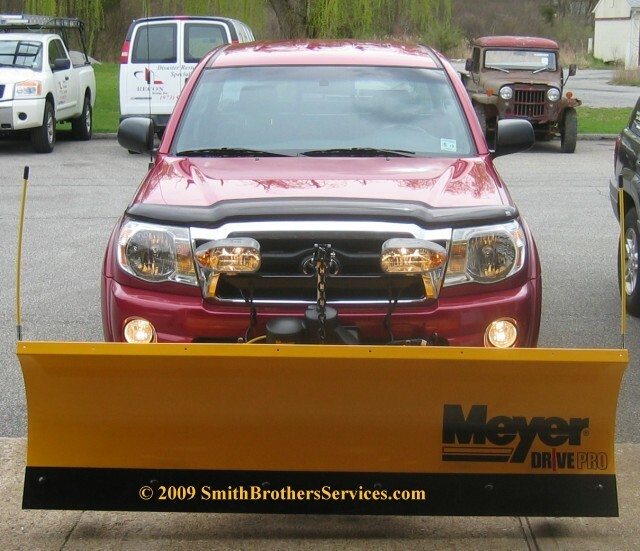 Meyer Drive Pro.com - The perfect plow for your Toyota Tacoma, 1/2 Ton Truck, Jeep, SUV, or small pickup - Site brought to you by Smith Brothers Services, ::C.
Since the SOS is now all a Distributor can order from Meyer from here on out, I want to put the information right at the top of this page. The SOS is the Standard Operating System. It is a wiring system for Meyer plows, and going forward, at this point, it will be the ONLY one. It is completely different that what has been used for the past 10 years or so. Rather than type all of the information I have up until this point on this page, I will simply point you to the Meyer SOS Information Page I already posted on our main site. Because it is an operating system, it all pertains to the Drive Pro as well. Here is a picture of the Meyer Drive Pro SOS. Looking closely, you can see all of the differences. It is a work in progress so to speak, part of Meyer's "Product Improvement Program", so expect "Running changes" and lots of them, because there already have been many. The picture shows no plow shoes, but I am told they put them back after initially taking them away. That is the tip of the iceberg.... Click that link above. 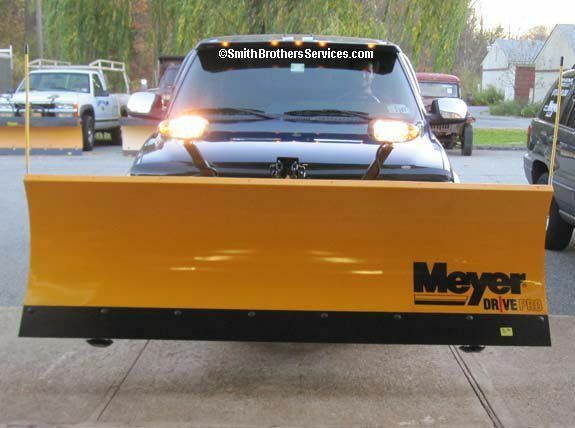 Drive Pro* is a rugged and easy-to-use steel or polyethylene (7'6" models only) snowplow ideal for tight residential areas or long driveways. Made for 1/2 ton or light pick-up trucks and SUVs, residential contractors will appreciate increased maneuverability and not having to compromise on quality construction. Weighing just 405 pounds, the Drive Pro 6'8" is strong in the right places. 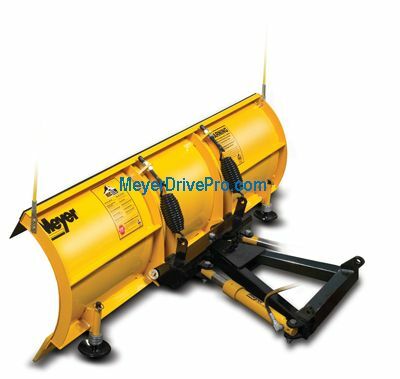 Drive Pros are made with the same heavy-duty rams and hydraulic system as Meyer full-sized plows and are assembled using Meyer's Reliable Over-time Construction process. They have a steel cutting edge, and steel trip springs. NO PLASTIC PARTS ON THE PLOW. 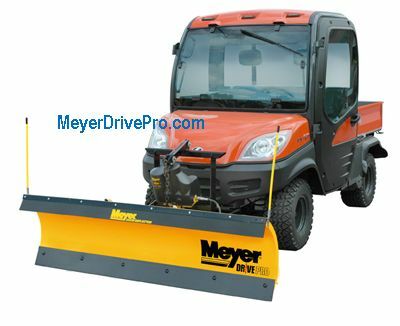 Initially, the Drive Pro was designed to replace the Meyer TM Series of plows. The Drive Pro Series was then expanded with the Drive Pro 7'6" for 1/2 ton trucks. The Drive Pro 7'6" replaces the ST-7.5, which was discontinued in November 2009. August 2014 - The Drive Pro 7.5 has been renamed the Lot Pro LD. It uses the EZ Plus vehicle mounting (which it always did). 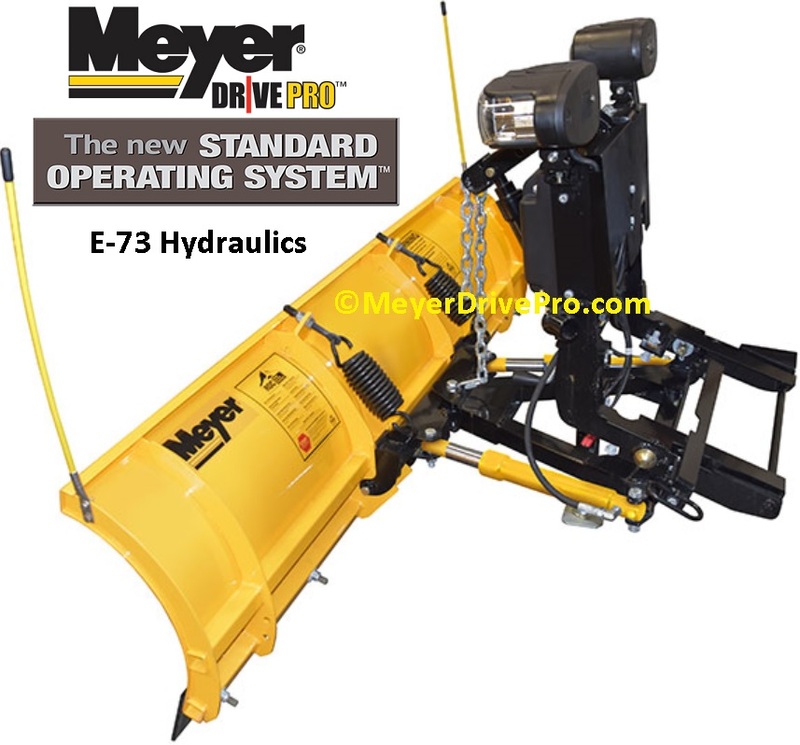 Meyer released what they call the Drive Pro 7.5 Single Pull. 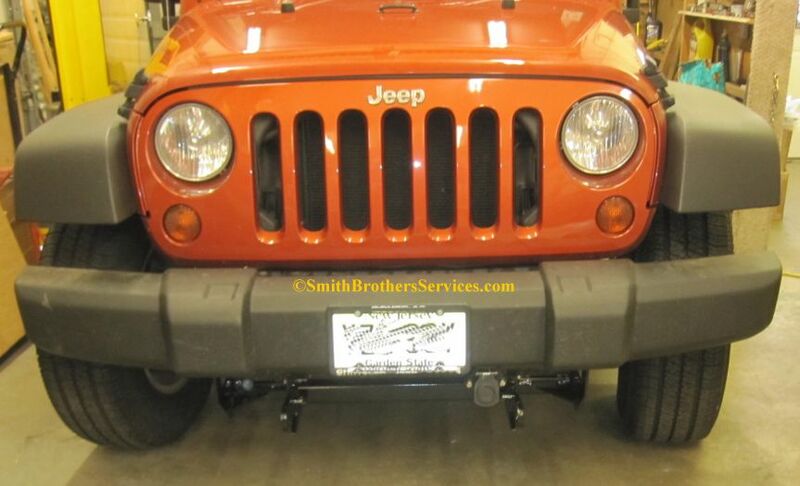 It is a 7.5' Moldboard that bolts onto the Drive Pro 6'-8" A Frame, so it uses the Drive Pro vehicle mounting with the single pull handle to dismount the plow from the vehicle. It is a lighter version of 7.5' plow than the Lot Pro LD. We will add pictures of the Drive Pro 7.5 Single Pull as we install more of them here. Keep in mind many of them (most) we eliminate the single pull, and convert them to EZ Plus. The single pull bracket that connects the pins interferes with easily getting the plow on in many cases. 7-31-17 Why a Meyer Drive Pro? What is so different about it compared to say The Home Plow by Meyer? 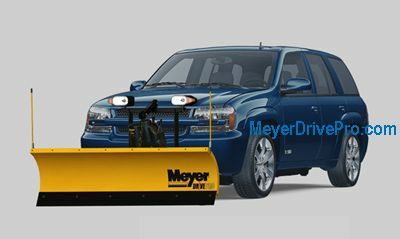 Well, the price for a power angling Home Plow by Meyer is pretty close to the price of the Meyer Drive Pro. Especially if you factor in freight and the cost to have it installed if you cannot do it yourself. When the Home Plow first came out, we were told it was to target vehicles that we could NOT mount a Drive Pro on, due to weight restrictions. It quickly evolved into putting the Home Plow on anything you could mount a front receiver hitch on. 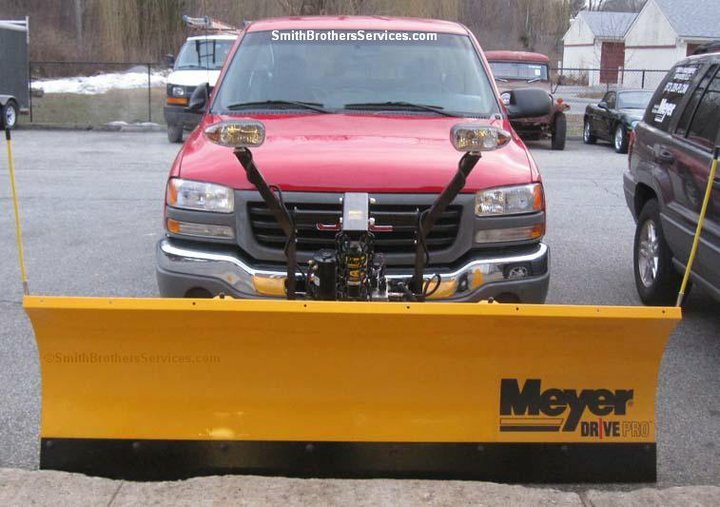 When the Home Plow by Meyer first came out, there was Auto Angling ,and Power Angling. Now there is many more options, and the auto angling version does not even use hydraulics. 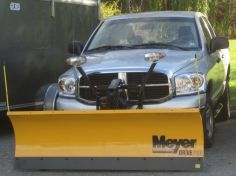 One of the biggest differences is that the Home Plow by Meyer has a ONE (1) year warranty. 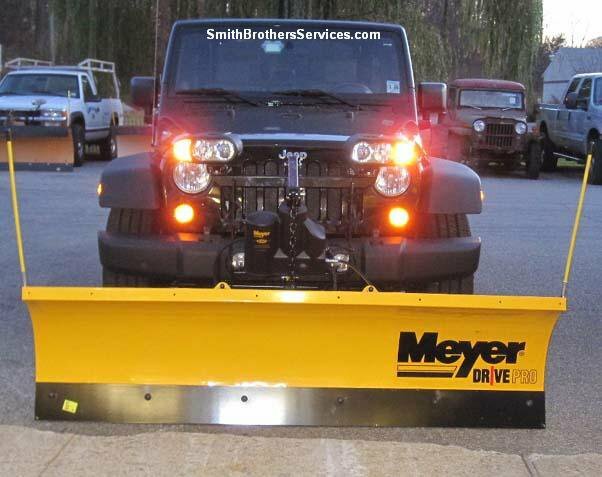 The Drive Pro has the same FIVE (5) year warranty that all other Meyer plows have. 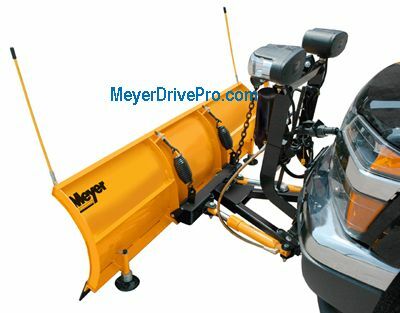 The Drive Pro is built heavier than the Home Plow by Meyer. Not only that, but it uses the same commercial grade hydraulics that the 8' and 9' commercial plows use, made by Bucher (formerly Monarch). There is no cheaper, smaller, less powerful hydraulic system used on the Drive Pro. The complete hydraulic system is the same. Power angling is the ONLY option. It uses the same 1.5" x 10" PA Rams as the bigger commercial grade plows. All of the wiring is the same. The controllers are the same (with multiple choices), with all the same features (Hands Free Plowing). It uses (now) Nite Saber III plow lights, just like the commercial units. The Home Plow does not even have a plow light option. 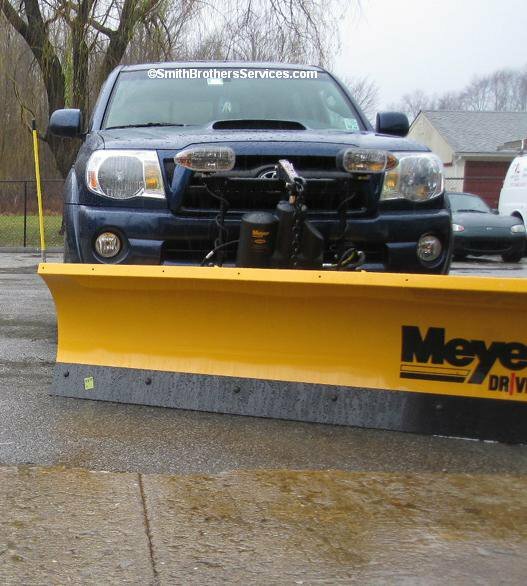 The Home Plow has a 1/4" steel formed cutting edge. 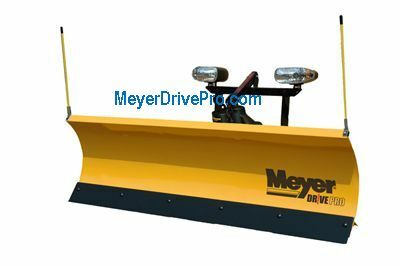 The Drive Pro uses a 3/8" steel cutting edge made from the same hardened steel that is used to make road grader blades. It is very durable. 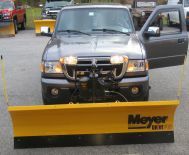 Because the Home Plow by Meyer uses thinner weaker steel, we have seen them come in with the cutting edge actually bent. That is not even possible with a 3/8" grader blade. 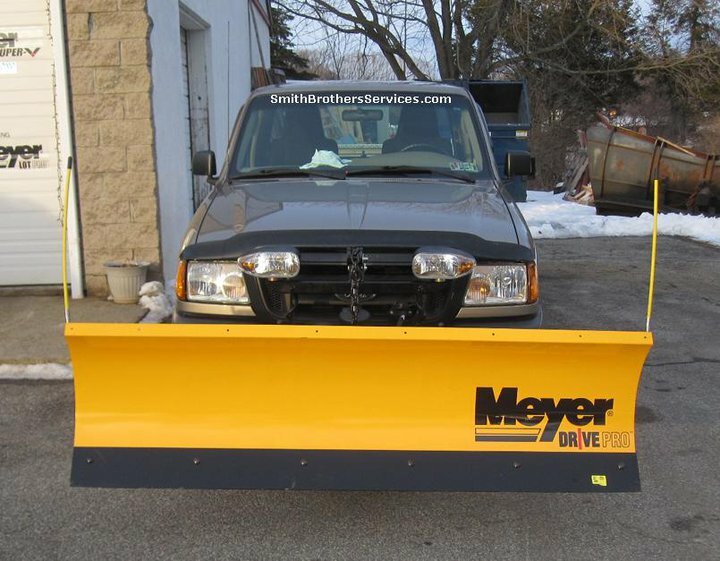 We also have customers that have been running the original edge on their Drive Pro for 8+ years, whereas we have changed cutting edges on the Home Plow by Meyer after only 4 years. 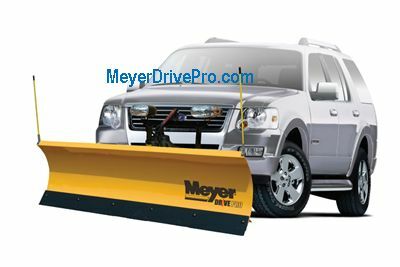 So to someone who does not know any better, the Drive Pro and the Home Plow by Meyer may seem very similar, but they could not be more different. 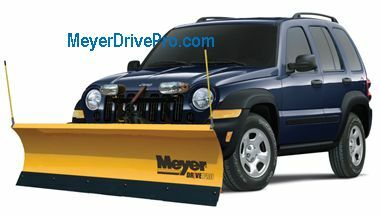 How to get around the fact that the Jeep sits too high for the plow to work properly. Three Jeep Wrangler TJ's with 3" lift and 33" tires, done in the fall of 2016. Since many visitors are not on Facebook, we are adding them here as well. They were added to our Facebook page right after completing them. also added to our Facebook page right after they were complete). 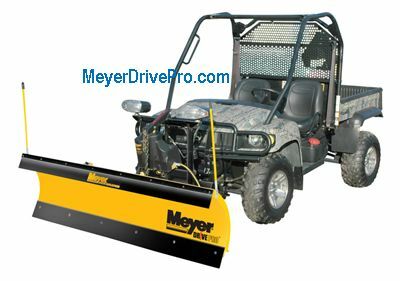 6-13-16 Buying a used Meyer Drive Pro Plow? 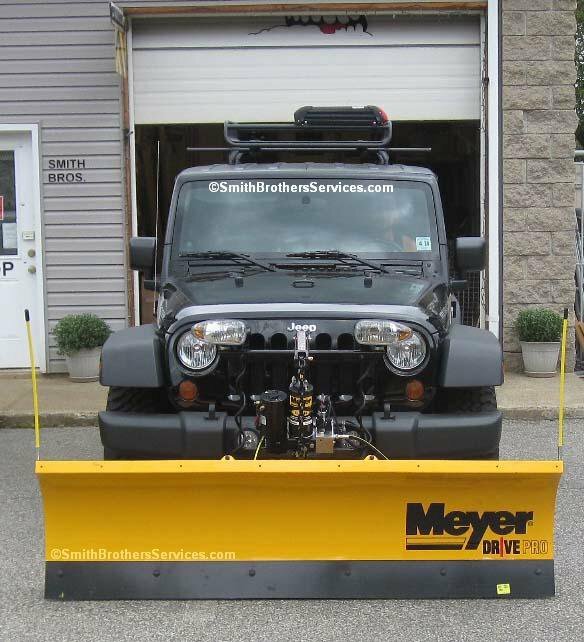 Jeep Wranglers with Meyer Drive Pro 6'-8" Plows Page The Drive Pro 6' 8" is available for the Jeep Wrangler from 1997 - 2016 Model Years. *Drive Pro is a Trademark owned by Meyer Products, LLC.